In a previous blog, I outlined how virtual archaeology was originally conceived as an approach by which technology could be harnessed, in order to achieve new ways of documenting interpreting, annotating and narrating primary archaeological materials and processes, by inviting practitioners to explore the interplay between digital and conventional archaeological practice. As such, it wasn’t just about ‘what was’ or even ‘what persists’, it was also a generative concept allowing for creativity and improvisation including ‘what might come to be’. Here, I want to share some more ideas which have crystallised out through discussions with my friend and colleague Gareth Beale, at the University of York, UK. (N.B. More in press) To begin, let’s as it were remove our gaze off the broad landscape of virtual archaeology and concentrate our senses on one exciting and potentially disruptive virtual archaeology technology which seems to us to offer greater cognitive depth: additive manufacturing (AM). 3D printing, or rapid prototyping, is one form of AM experiencing a great deal of hype at the moment. However, AM more generally, encompasses a set of far more mature and for archaeologists, more profoundly relevant technologies. At a very high level, the huge array of available AM technologies can be loosely classified into three families (for a full treatment refer to H. Lipson & M. Kurmar’s ‘Fabricated: the new world of 3D printing’. Wiley. 2013). Selective extrusive printers in essence squirt, squeeze or spray pastes or powders through nozzles, syringes and funnels of all sizes to build up objects by depositing materials in layers. Selective binding printers by contrast, fuse, bind or glue materials together, again in a layers. The aforementioned technologies can, in one sense, be seen as producing analogue printing or additive manufacturing outputs using digital controllers. Currently at the cutting edge is true digital assembly using pre-manufactured physical objects. We can think of them as Lego blocks. However, precise assembly of billions of small physical voxels made in different and multiple materials remains a huge computational and fabrication challenge. Of course, hybrids, deploying multiple print heads, deploying various different fabrication methods, could also be configured. Lipson and Kurmar summarise the evolution of additive manufacturing as three episodes of gaining control over physical matter; control over geometry, composition, and behaviour. First is an unprecedented control over the geometry, or shape, of objects. 3D printers can already fabricate objects of almost any material in any shape. Next is control over the composition of matter. We have already entered into this new episode where we go beyond just shaping external geometries to shaping the internal structure of materials with unprecedented fidelity, with the possibility of printing multiple materials including ‘entangled components’ which can be co-fabricated simultaneously. The final stage is control over the behaviour of materials, where they envisage programmable digital materials – made of discrete, discontinuous units – which are designed to function in a desired way, such as spongy, transparent, rhinoceros-shaped, in shades of grey and blue – perhaps even embedded with nano devices. Voxel-based printing affords the notion of different types of physical voxels. Imagine, if you will, a library of archaeologically-defined material voxel types. Control over shape provides a bridge between existing 3D modelling formats and the ability to re-purpose them as 3D printed physical objects. Existing point clouds, terrain and solid models,indeed any system that can output STL format files can be 3D printed. By way of example, a 3D-printed map of the cone, crater, and summit of Mount St. Helens, Washington, USA, is available on Shapeways.com in three sizes! Geologists are already 3D printing stacks of geology (i..e., stratigraphy) from north eastern Germany. Although these examples produce solid objects made only in a single material, with the same density throughout, they nevertheless communicate in a very tangible fashion. In fact, makers print all kinds of materials: from bread dough, chocolate, and other food-based materials with their pronounced olfactory characteristics (which, incidentally, introduces another cross-sensory modality into the mix), to gypsum, sand, soil, terracotta, metal alloys, plastics and polymers. At a somewhat higher level of technological sophistication, and, commensurately funding, modern industrial additive manufacturing technologies span a wide spectrum of applications across a very broader range of scales: from bioprinting living ink; replacement body parts and prosthetics; manufacturing textiles; ceramics; glassware; jewelry; furniture; weapons; vehicle components: and innumerable parts and fixtures, including 3D printer components. Crucially, they can also combine multiple entangled materials. Stepping back and opening the aperture of the nozzle somewhat, let’s look at some more examples at a much larger scale. For example, Midwest Studios 3D printed a highly detailed architectural model for a new Carmelite foundation, designed as a classic French gothic monastery, in Wyoming, USA, using the architect’s CAD files. In Europe, Hansmeyer and Dillenburger, Swiss architects, created and 3D printed an ultra-modern, gothic-like, human-scale, immersive space dubbed the ‘Digital Grotesque’. Both NASA and the European Space Agency are exploring the feasibility of building future moon-bases using fabricators exploiting local materials (i.e., regolith or lunar soil). 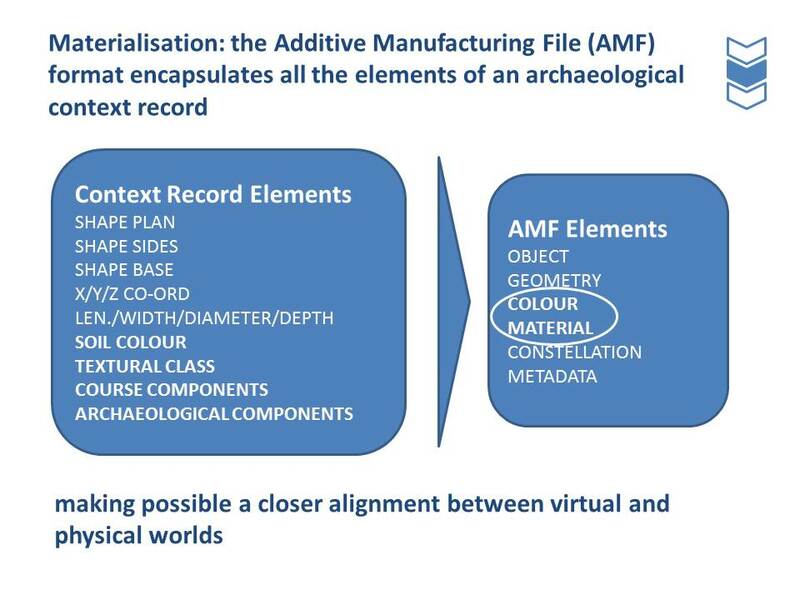 Of course, at the moment, these projects require the use of (crucially) terrestrial simulants, in other words materials with the same necessary material properties.Becoming more speculative, more aspirational, let’s now explore some facets of additive manufacturing pertaining to materialisations of virtual archaeologies that might come to be. As additive manufacturing evolved from producing primarily single-material, homogenous shapes to producing multi-material geometries in full colour with functionally graded materials and microstructures, it created the need for a standard interchange file format that could support these powerful new features. The response was the Additive Manufacturing File format (AMF), an open standard for describing objects for additive manufacturing processes such as 3D printing. What is striking about the AMF format is that it encapsulates the typical recording sheet used on a modern archaeological excavation, but does so in much finer spatio-compositional (i.e. both macro-morphological and micro-morphological) detail. If we did recast our recording method to generate contexts described in an AMF-like format, we suggest that archaeology would be a step closer to aligning the virtual and physical worlds, and a step closer towards the possibility of rematerialising archaeological entities found in the field. What is to stop us from recording our excavations in such a way so as they can be refabricated? Current methods are clearly deficient. Here, by the way, we are not suggesting that all excavation should be 3D printed. We submit that if we recorded in such a way that we could rematerialise, or refabricate, our excavations in 3D then we would have improved substantively our practice. Some will argue that current procedures are adequate for current needs. We counter, that in a uniquely destructive discipline, are we not ethically obliged to strive for superior recording practices? We contend that AM provides a credible challenge to traditional archaeological practices (e.g.in recording). With this in mind, we call for disciplinary grand challenge for this generation of archaeologists, to fabricate an excavation, that is an excavation – rematerialised geometrically and compositionally accurate – whereby the curious can explore iteratively, reflexively, and comprehensively, the disaggregation and reassembly of archaeological entities encountered through archaeological intervention in such a manner as to engender a constant, multivalent, hermeneutic cycle between analysis and synthesis. We envisage that in striving to meet this challenge, the discipline will establish elements of an exemplary platform for strategic innovation, affording the development, and structured introduction of innovative and distinctly archaeological approaches through technology. In so doing we create a catalyst for increased innovation, strength of purpose, and direction in digital archaeology.